Black Site: New Alcatraz is a worker placement game where each player takes on the role of a lieutenant warden with the responsibility of managing a secure facility through choice placement of various guards and gaining resources determined by the placement of those guards. Be careful though, for each guard you place, inmates will move from one location to the next, causing overcrowding and riots. Furthermore, as a lieutenant warden, only you are allowed into highly secure areas on the game board. Recruit your guards, choose your actions, raise public opinion, and keep your security levels low! 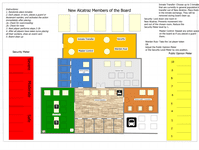 Please find a link to the working rulebook as well as a beginning image of the prison. I have several problems I'm trying to solve, but I'm sort of stuck at this point and not sure where I need to continue in order to make progress. Each location on the board is a spot for your ltnt. warden or your guards. Each spot will garner you resources, like clout, but every time you place a worker, you must move prisoners from one location to the next. When doing so, you have to watch overcrowding and make sure high security inmates don't share the same location. If you do, you might cause a riot or overcrowd that area of the prison. Edit: I have uploaded a newer image below. So I'm uploading a module to Tabletop Simulator but have come across a problem- The rooms and locations aren't delineated enough. 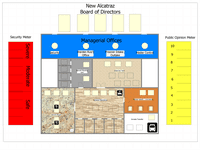 What I mean is that the dark lines, especially on the board of director card spots above, can't be seen well. In addition, the lines for the security meter and public opinion meter don't show very well. It's not a pretty board, and it's not meant to be pretty, but I need to update it can be seen on Tabletop Simulator, at a minimum. I'd love to make the board more clear and organized, but I'm not a layout and design person. I'm a sucker for WP, and this looks very interesting. Thank you! I wish I was able to do graphic design better. My main goal is to make the choice of placement a possible risk. Do I put my worker here with a risk of causing a crowding issue, or do I place here to get the contraband from the high-security inmates without causing a riot. My next goal is to figure out how to implement event cards in the game. Since every placement has 'movement' on the board that could cause something bad to happen, it might be overkill including event cards. However, I think having a way to pull in and send off the inmates is in order. At the end of the round, the first player draws an event card. Events happen before the players begin their round. I could reduce the seriousness of the cards and have players draw at the end of each turn, but I think that's overkill and will be annoying to have it happen after every player's turn. What other ideas might we have for events? In the current iteration of the rules, the players, as lieutenant wardens, collect and use reputation. Reputation can be spent to increase actions- like rehabilitate an additional prisoner or protect from overcrowding. I am thinking that collecting reputation just to exchange it for small benefits only makes the game needlessly complicated. I'm still in the early stages and definitely not ready to playtest. However, I'm eager to reach that stage and at least play through a couple of rounds. Do inmates ever get out of your prison because they've finished serving their time? So far it seems like they can only escape or be transferred (presumably to a different prison). The stated goal of the prison is to reduce costs, meet human rights standards, and so forth. Having the players collect "reputation" assumes these things as a given. Why not challenge the players to meet these goals? Yes. As I work out the rules the inmates will be rehabilitated. For example, if a player puts a worker in the counseling center, they can reduce the threat rating of an inmate. If they reduce beyond white, the lowest threat rating, the inmate can be "released". Having a spot for releasing inmates due to time served or good behavior might be a good thing to incorporate. Good call, Legomancer. I like the idea and I'm glad you noticed a weak spot in the concept. I am working on a Tabletop Simulator module of the game. Would anyone be interested in trying it there? I will also make a mod in Tabletopia to try out. I've uploaded a cleaner image to look at. As I'm thinking about the design, I'm coming up with card ideas to draw at the end of a completed round. Here is a link to the cards I currently have. What do you think and what might you suggest to add?